The out U.S. senator from Wisconsin joined fellow Democrats in filibustering on the issue today. 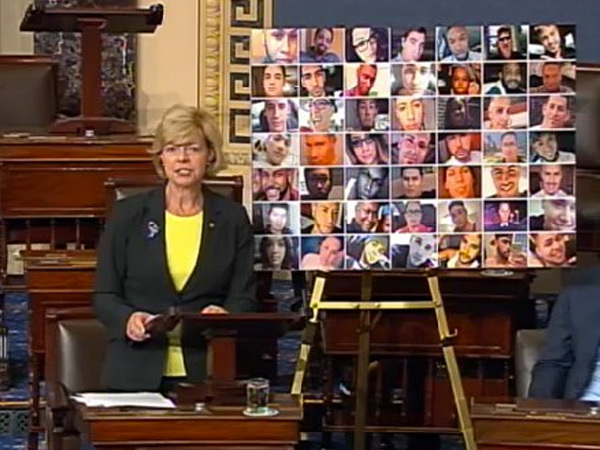 U.S. Sen. Tammy Baldwin of Wisconsin, the only openly LGBT senator, joined her Democratic colleagues in pushing for stronger gun control today, pointing out that multiple factors caused the Orlando massacre and all of them need to be addressed. Senate Democrats shut down other business in the chamber today to fiibuster on additional gun control measures, with more than 30 senators taking turns speaking to hold the floor for more than 10 hours. The focus is on legislation introduced by Sen. Dianne Feinstein of California “that would allow the attorney general to ban gun sales to suspected terrorists, including those on watch lists, if there is ‘reasonable belief’ the weapons may be used to carry out an attack,” as USA Today reports. She also said she would support additional funding for the Department of Justice to prevent and investigate hate crimes, and Pennsylvania Sen. Bob Casey’s proposal to ban gun sales to people who have been convicted of a misdemeanor-level hate crime. Baldwin, a lesbian, added that she spoke as “a member of the LGBT community,” and noted that LGBT Americans have made great progress in the past few decades but more needs to be done. She went on to read the names of the Orlando victims and offer information about them. “The time to act is now, and our thoughts and prayers … are important but not enough,” she concluded. Watch video from C-SPAN below.